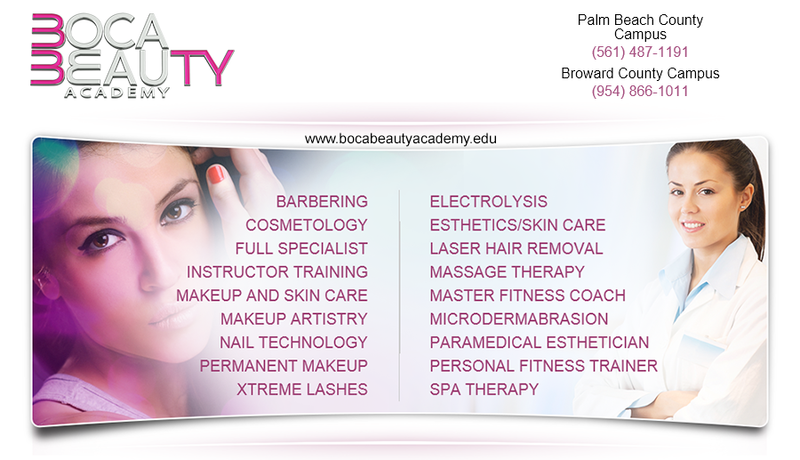 Boca Beauty Academy is a Nationally Accredited beauty and wellness college conferring diplomas in the fields of Permanent Make-up, Electrolysis/Laser Hair Removal, Cosmetology (Hair), Skin Care (Esthetics), Massage Therapy, Nail Technology, Make-up Artistry, Microdermabrasion, and Instructor Training. Our new waterfront campus is ideally situated in the “Beverly Hills of the Southeast” in sunny Boca Raton, Florida. Our campus is located on the same street as the world renowned Town Center Mall and minutes from the ocean. We strongly encourage out-of-state as well as international applicants to visit our campus. Boca Beauty Academy has a long and distinguished history as a leader in spa and beauty education. Our graduates are aggressively recruited each year for roles in elite salons and spas, cruise ships, resorts, & medical practices throughout the United States and overseas. Our students are special and are a direct reflection of our teaching ability. Our reputation depends on their future success and work habits. We recognize that each student is unique and learn at different speeds. We adjust our approach to each student’s needs to mentor them carefully and sensitively. We take a great deal of pride in our graduates which is reflected in our strong alumni network and our active job placement program. For scholarship information, please send an email to feedback@bocabeauty.com and be sure to state in the subject line Permanent Cosmetics Directory. We look forward to hearing from you!